You know that tournament that started today, the one that always starts in March, that everybody’s mad about? Have you made your picks yet? You can make real time edits to your brackets using Realtime Brackets from SB Nation. Some people pick colleges based on football wins, others based on previous year’s wins, or other athlete stats. But no matter how you predict who will end up in the Final Four, it’s going to be fun to pick and watch to see who wins! And while you enjoy watching all those exciting basketball games, you’ve got to eat, right? 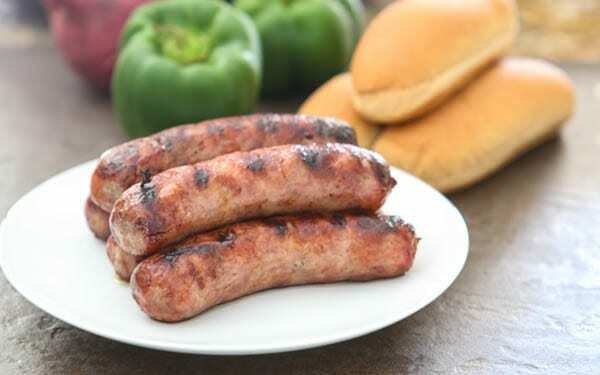 And just because you’re relaxing in your Lazy Boy in the comfort of your home doesn’t mean you can’t enjoy tailgate favorites like these delicious Johnsonville Brats. 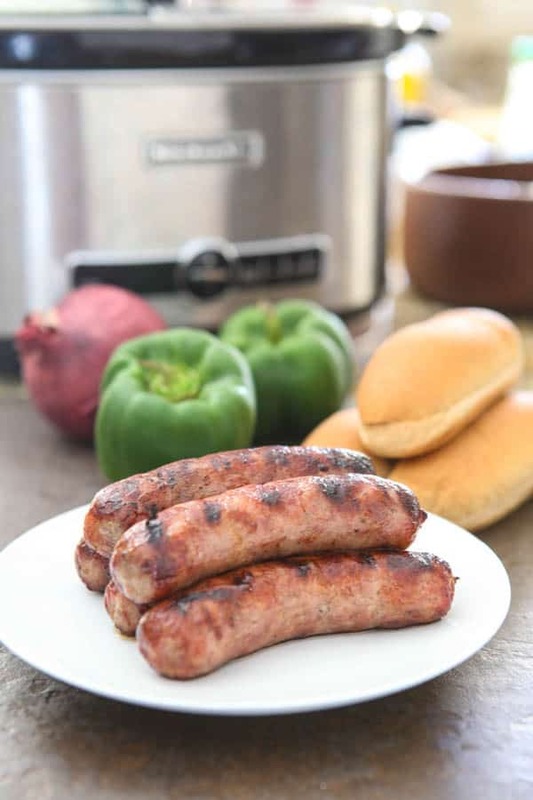 You can bring the tailgate party indoors by making these simple beer brats in your crock pot. Make as little or as much as you want for a big Basketball Party! For these brats, I first grilled them on my grill. But you can also use an indoor grill pan, or just sear them in a skillet. Next, just transfer the cooked brats into your slow cooker with some bell peppers and onions. Then you’re going to have to sacrifice a few beers and pour them over the brats. Turn your slow cooker on low and you’re brats will be ready in about 2 hours. I really love this recipe because you can keep leftover brats warm in the crockpot throughout the game. 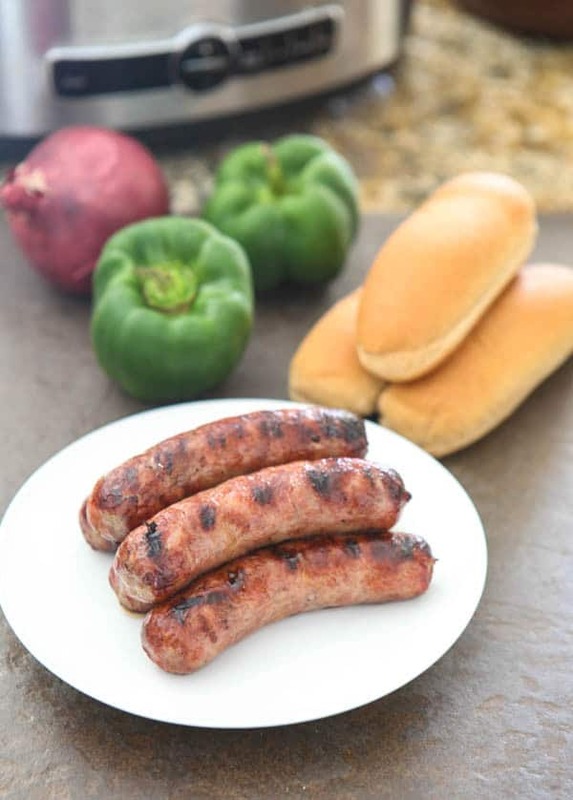 These brats are more than amazing, and you an your guests will absolutely love them. We like to serve them with sauerkraut, chopped salad, lots of potato chips, baked beans and of course, beer. Add your Johnsonville Brats to the slow cooker and heat until the brats are cooked through, about 2 hours. Reduce heat to low to keep the brats hot throughout the game. These are so good and absolutely loving cooking them in the slow cooker. I’m imagining how good these would taste after steeping in beer for a couple of hours…and now I’m salivating. Great idea! Brats have always been my favorite wurst. YUM! These look great. My husband would eat this all March long! Crockpots are lifesavers, aren’t they? My husband would love these! Great game day food here!! I love cooking with my crock pot – it’s such a time saver. LOVE that you made this in the crock pot…..totally doing this for dinner this week. I absolutely love using my crockpot and these look fantastic! My guys love brats and making this in the crock pot is even better! Oh, my fiance would be ALL OVER this recipe. He loves beer and brats. Beer brats are my jam! I love that you took all that flavor and put it in the slow cooker ot make it even easier! LOVE! Why have I not heard of soaking brats in beer before! Gotta make these for my hubby!